There is no doubt that the 2015 Hague Symposium is about the big questions, the big “wicked” questions – the ones that require moving mountains. And just into our second day, we attempted carrying away small stones from this big mountain – theory(ies) of change in post-conflict transitions. 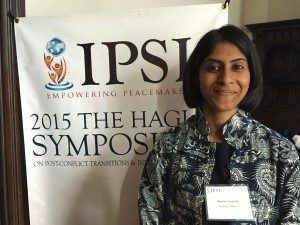 As someone with both thicker academic and thinner practical experience in peacebuilding and post-conflict transitions, I was amazed at the ideas – breadth, depth, coherence and applicability – that were voiced in the sessions facilitated by experienced peace leader and post-conflict expert, Audra Dykman. In four separate groups, we tackled issues ranging from security sector reform and resource security to community resilience and political transformation. Role-Playing Ms. Dykman divided the 47-strong symposium participants into four groups of varying roles. We had donor governments, international NGOs, local NGOs and the beneficiaries. The participants in my group, which represented the donor-government team, came from varied backgrounds, consisting of academics, practitioners, diplomats, lawyers, and specialists in human rights, refugee issues, and more. As mandated by the assigned roles, our aim was to develop a strategy/approach that would address the post-conflict transition issues in Libya within a 6-month time period. Strategy and Approach Our team took security sector reform by the horns and decided that within six months, the most feasible change would be to enable the bringing together of all security sector stakeholders in order to deliberate and agree to a common agenda for reform. As a national-level strategy, we called it the ‘Inclusionary Empowerment Framework/Initiative.’ We also formulated a range of measures of success for this time-tight initiative. They included the simple, the symbolic, and the systematic successes, such as stakeholders agreeing to be the drivers and beneficiaries of the initiative, reduction in violence within the six months, establishing safe zones, and actually coming to an agreement on a common reform agenda within the set timeframe. The other groups tackled issues of political transition through elections, supporting local communities to prevent young children being drawn into violence, and helping people to rebuild communities through constructing resource infrastructure, such as for sustained access to water. This is an impressive array of post-conflict transition issues, each one equally important, intense, and infinitely complex. The questions we asked each other and ourselves at every stage of the strategy formation – conceptually, programmatically, and operationally – made us realize that every small stone being carried away needs careful, thorough and deep consideration. Conclusion: In hindsight As I headed back for the evening, I couldn’t help wonder if we missed something. Were we critical enough? Did we sufficiently question what we were doing? The questions I did not hear today from any of the groups, including our own, were: Is change the best option for Libya? Do the people/stakeholders of Libya want change? The biggest mountain is our assumptions as peace leaders and peacebuilders. This is the dark side of ambition, goodwill and the pursuit of peace – the assumption that the mountain needs moving. Most often it does, but let us pause and reflect for a moment, just for a moment, so that we can ensure that our assumptions, strategies and theories of change are not creating or enabling even wickeder problems. This was also one of the main closing comments from Ms. Dykman – that however focused, specific or innovative the initiative is, and however participatory and inclusive it may be, the strategy must always include active learning mechanisms and iterative feedback loops. This is critical to any theory of change.